Townsend Farm's 2019 kids have arrived and we are taking deposits. 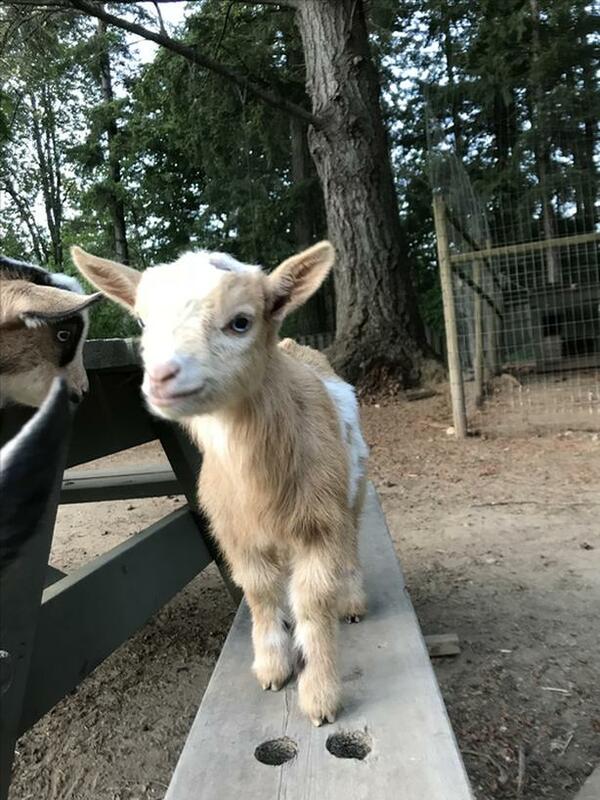 All our breeding goats are registered purebred Nigerian Dwarf Goats and live here on our farm. The kids are handled within moments of birth, making them very sociable and tame. They are much loved and played, even join us for snuggles on our patio (only the babies ☺). Currently, we have 3 babies (all with blue eyes and a variety of colours) looking for great families. Ready to go to their new homes. These little kids would make great pets and will help with the yard work. Our new kids come disbudded and the boys weathered. Weathers are $200/each, little doelings are $400. We are downsizing our herd this year and have gorgeous yearlings and does. As well as two bucks. Please email or text for more information, telling us a little bit about yourself and your situation.